When you hear the words “DIY holiday ornaments,” you probably think of the sequin-spackled wood blocks you brought home in grade school, or something super elaborate that only Martha Stewart could accomplish. 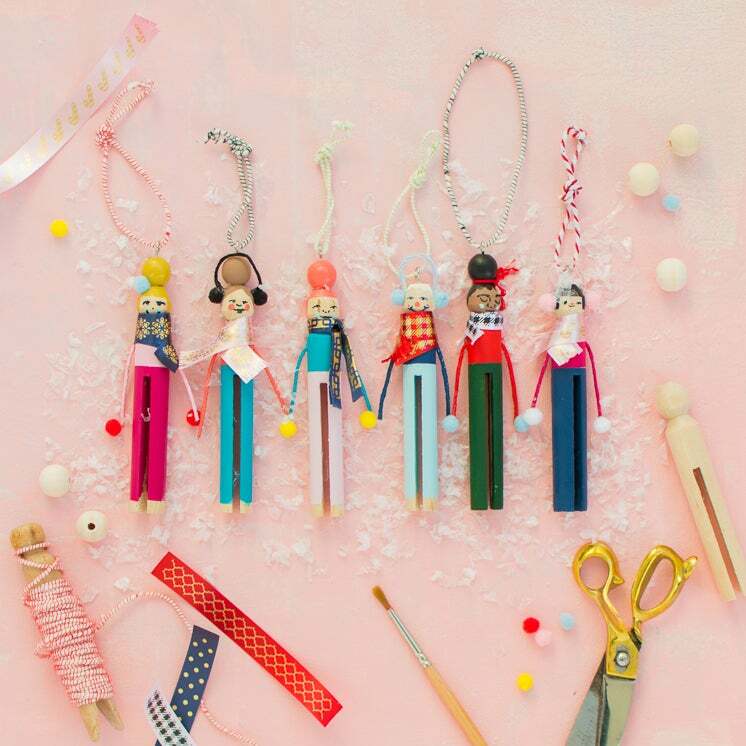 However, there are tons of dazzling do-it-yourself ornaments you can actually pull off. Whether you have a traditional spruce that could use a little pop of color or a modern, all-white Christmas tree that needs an equally understated element, we have your holiday ornament inspiration locked down. From the traditional to the more “out-there” pieces, ahead, you’ll find the easy-to-make ornaments we’ll be crafting up all season long. These effortlessly cool snowflake-inspired ornaments fall somewhere in between Scandi-chic and modern farmhouse, combining two of our most beloved aesthetics in one no-fail swoop. Intricate in detail yet beautifully understated, this DIY promises to lend a design-forward element to your holiday decor. File this one under one of the more creative uses of a clothespin we’ve seen. Leave it to Brittany of The House That Lars Built to totally school us on the art of reinventing a household staple. Give classic baubles a pattern-heavy twist and a tonally defined finish like this colorful DIY project from A Kailo Chic Life. Opt for a relatively reserved color palette to avoid a chaotic look and add pattern sparingly. These ornaments are completely customizable. Start with cardboard ornaments from the craft store, and glue on a patterned fabric of your choice. This one really has endless possibilities, since you can use any type of fabric. Pro tip: Buying a pack of quilt squares would get you manageable fabric pieces in a ton of different patterns. These modern wood ornaments from Say Yes are seriously stylish, and we love how they can be painted any palette you want. Plus, they’re completely kid and pet-friendly. Make these zodiac-inspired ornaments for your astrology junkie friend (or keep them for yourself). They’re another great clay ornament DIY that’s super simple to make, and really pretty too. These are the LBD of holiday ornaments. Simple beads in neutral wood make this look work in any space. These could easily be painted, but in their natural state, they’re perfect for all you Scandinavian holiday lovers. Once you realize how easy it is to create this marbled look from clay, you’re going to want to make everything look like these pretty ornaments from Oleander and Palm. They can easily be made into any shape you want. Merry berry! Bring the outdoors in by filling glass ornaments with richly-hued berries. Get creative with various sized orbs and a bounty of seasonal botanicals. Pro tip: This is a great way to add an organic element to a faux fir. Keep bad juju away and make your tree sparkle with these evil eyes—they’re as pretty as they are protective. The best part? You don’t need to start from scratch; these playful peepers are painted on plain old ornaments. Because no matter how far away you are, your BFF will always have a place in your heart—and now your tree, too. This is the perfect present for a bestie who lives far away. And, if she’s local, why not spend the afternoon DIY-ing it together?